I hope you have all been having a great winter so far. For me the early season ice climbing was great with a couple Black Dike ascents getting it off to a good start. Then we got 82 inches of snow in December followed by another foot the first week of January and it appeared we were about to enjoy an epic snow year. Then between January 11th-13th we received 3 inches of rain and lost over two feet of our snow-pack. A highlight of this event was a massive wet slab avalanche that was larger than one recently retired Snow Ranger saw in his 10+ years of service there! Standing out on the debris with students two days after the slide one could not help but be impressed by the power of Mother Nature. It made regional news headlines and I saw quite a few people trek up to the floor of the ravine just to get a first hand look at it! January failed to recover our snow-pack finishing the month with a total of only 29 inches (12 of which were washed away during that rain event). That is less snow in January in more than 10 years! While it seemed a bit devastating the bright side was we started seeing ice form in strange places and ephemeral routes like Gandolf the Great and Hard Rane came in FAT! All this ice was great for the 25th annual Ice Fest and despite a burly cold first day of the event folks seemed to have a great three days at the event. Here’s some footage showing our last day of our AIARE 2 course which should get you stoked for the rest of the ski season! If you do book any of these courses be sure to use “DavidNEM” in the promo/notes box to be entered into a drawing for a free guided adventure. I have been testing a ton of great new gear this season from companies like Petzl, Sterling, Black Diamond, Kailas, Arcteryx, DPS, Dynafit, and many more. Expect to see a lot of new gear reviews posting in March and April as I find time to give these products honest and detailed reviews. Looks like another nice dumping of snow (totals up to 14″) is coming Wednesday so I’m really looking forward to this weekends avalanche course! Hope you get out and enjoy the snow and thanks for reading! First Avalanche Course of the Season! This weekend we conducted our first AIARE Avalanche Course of the season and it was so lit! Seriously we couldn’t have hoped for better weather and conditions! Combine that with our NEW classroom space at Great Glen Trails Outdoor Center and we had a fantastic 3 days! Here’s a quick recap! After a morning of classroom we headed outside where a perfect terrain feature provided a realistic avalanche rescue demo for our 13 students. 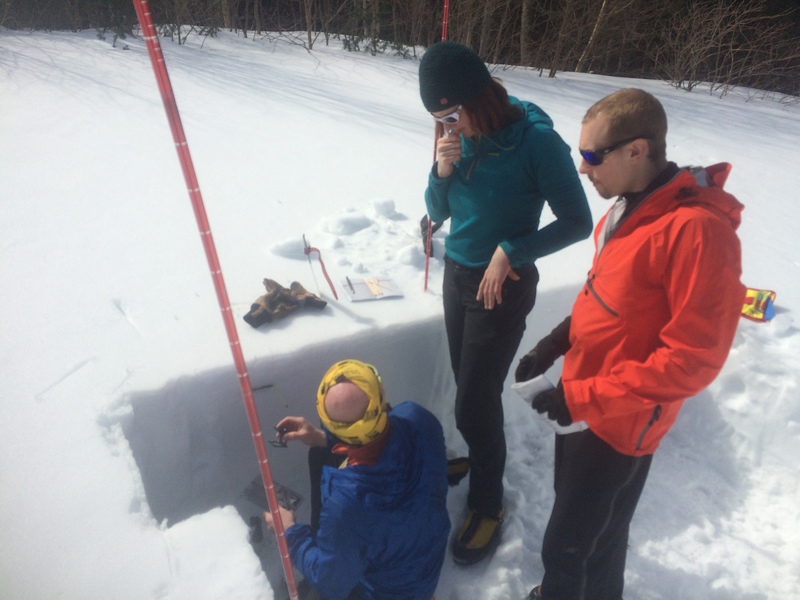 After another morning of engaging classroom discussions we were out the door just after lunch to conduct our “Observational Outing” in a shallow yet dynamic snow early season snow pack. After wrapping up class we got to drive back through the notch in quite the snow squall! Here’s some short clips from my Instagram story that afternoon! For our final day we met at Pinkham Notch Visitor Center and the students, armed with recently acquired knowledge, dove into trip planning sessions to plan our tour. By 8:45 am we were skinning up the Tuckerman Ravine Trail to put to use everything we had talked about the previous two days. The following photos are all courtesy of Alexandra Roberts. Upper Sherburne ski trail was in pretty good shape! Back at Pinkham Notch Visitor Center we reviewed our ski tour and debriefed the course before parting ways. 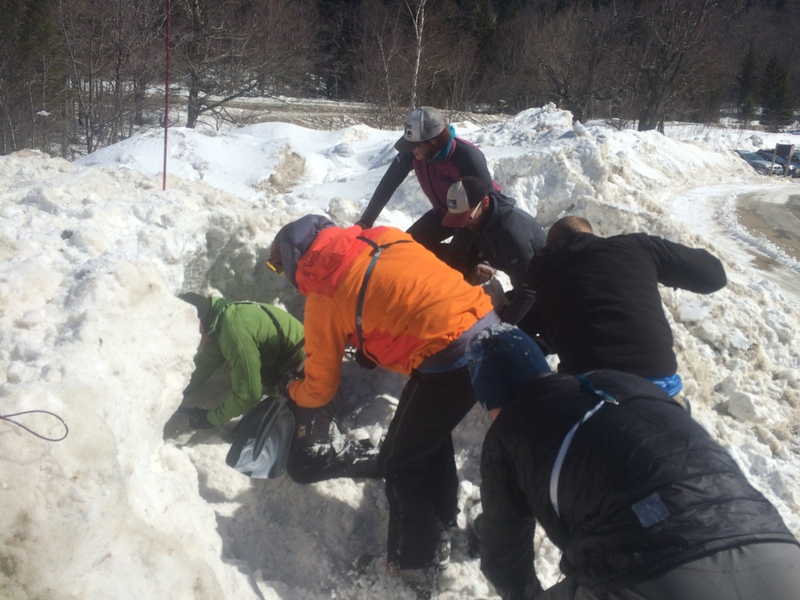 By all accounts the first avalanche course of the season was a huge success. A big thanks to the 13 students who made it a great course by asking great questions and staying motivated through-out! Hope to see you all out there practicing your new skills! Thinking of signing up for an avalanche course this winter? Some of our courses have already sold out and many are close! Course price includes two nights of lodging at The Bunkhouse! You can book here, and use promo code “DavidNEM” to be entered to win a free guided trip of your choosing! AIARE 1 Avalanche Course and hello Spring! The last weekend of winter provided one of the most spectacular 3 days of higher summits weather I have ever seen in March! 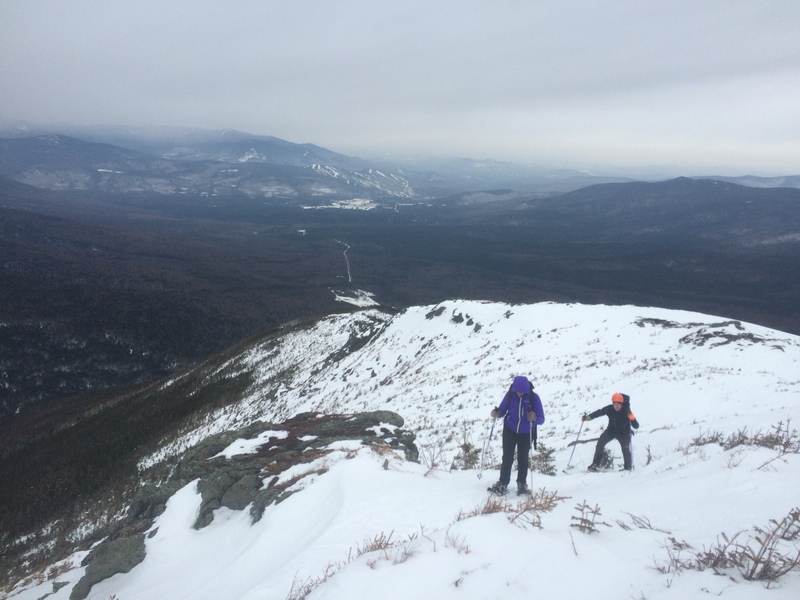 Blue skis and almost non-existent wind led to some really enjoyable ski touring on Mount Washington during our second-to-last American Institute of Avalanche Research and Education (AIARE) course. We kicked off the course on Friday with some lively classroom sessions and small group exercises. Benny discusses identifying avalanche terrain on day 1. 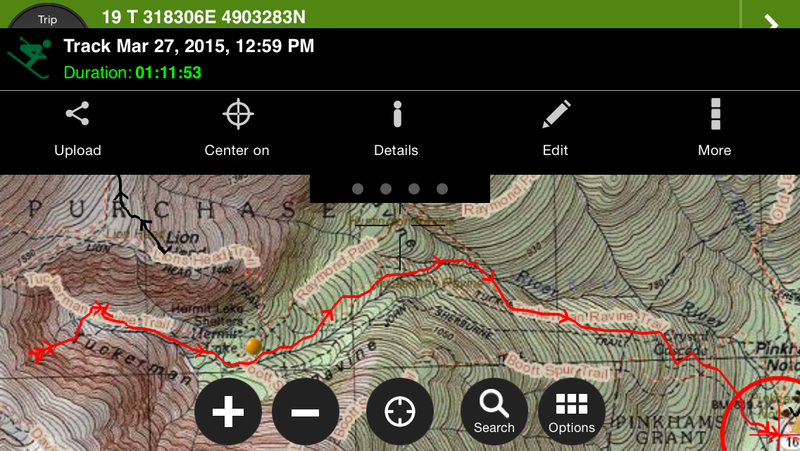 We met early to learn some advanced trip planning skills using CalTopo.com and the Avenza App. 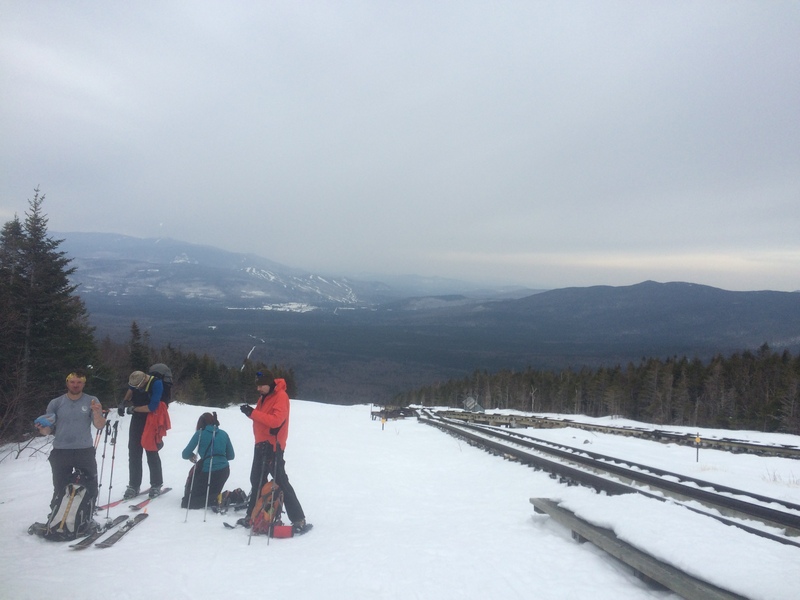 The Higher Summits Forecast called for southeast winds around 10-15 mph so we planned a tour on the west side of Mount Washington. Powerful trip planning software that is 100% free! We contoured around the rim of Ammonoosuc Ravine until we could drop the main gully or “Center Ammo”. We concluded our tour with a debrief at the trail-head before calling it a day. Avalanche danger was LOW and we had plenty of time to spare so we booted up Lobster Claw and traversed over to the top of Right Gully. All smiles after a good run! We wrapped up the course back in the pack room with discussions about continuing to learn about traveling in the back-country. It was a real pleasure having each of you in this course. Thank you all for staying engaged and contributing through out our three days! Only one more avalanche course next weekend after a Mountain Skills Course tomorrow and Washington Climb on Thursday. It might seem like the winter season is winding down a little but we are set up for a fantastic Spring ski season! The warm rock climbing can wait this year… I still have a lot of skiing goals to accomplish including reviewing some new ski mountaineering gear from CAMP/Cassin, Ortovox, Petzl, and DPS. Expect a lot of gear reviews to be landing April/May after I get back from Iceland. Yup, Iceland! Been awhile since I’ve been out of country so I am SUPER amp’d about this upcoming trip. 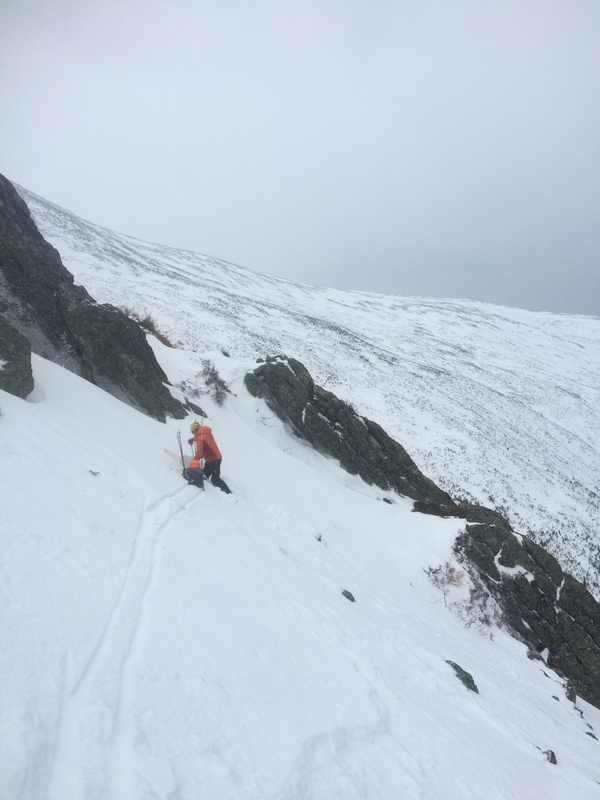 Want to try backcountry skiing? Maybe you just bought a setup or still need to rent a touring package (a few places in town rent touring gear). 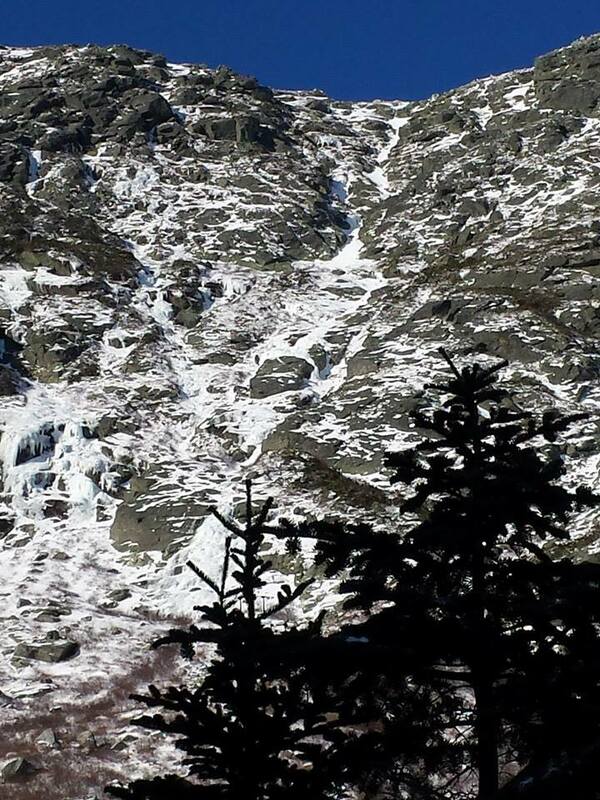 Maybe you’d like to avoid the maddening crowds in Tuckerman Ravine and check out some new to you terrain ? Consider learning about the joys of back-country skiing with me. The snow-pack we have in the alpine right now combined with more stable Spring weather is a GREAT time to book a back-country ski day! You can read a bit about the program here but reach out to me directly at nealpinestart@gmail.com to check on available dates before trying to book! Did you get out this weekend? Whatcha do? Let me know in the comments below! Well thanks for reading, and welcome Spring! A couple weeks ago I kicked off this seasons weekly gear reviews with Outdoor Apps Review Part 1, where we looked at three of my most used outdoor apps; ViewRanger GPS (USA), MyRadar, and PeakFinder Earth. While those apps covered navigation & weather, for Part 2 of this series I’d like to focus on snow safety apps. Check them out below and if I’m missing a must have app please let me know in the comments below so I can check it out! I use this app mostly in the winter while teaching avalanche courses and ski touring in the back-country. 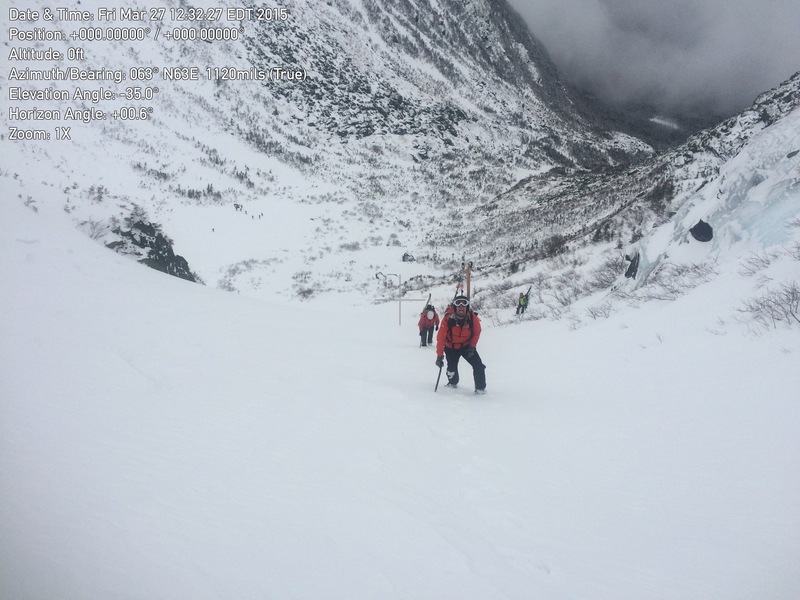 You can look down a slope or gully and get accurate information on aspect, elevation, and angle, three critical components to terrain selection when managing avalanche risk. Check out this short video showcasing its features. 2. Mammut Safety App Free! There are a few different “observation & recording” snow science type apps out there. This is definitely one of my favorite for its comprehensive scope and intuitive design. It is however an advanced app requiring a strong foundation in snow science and avalanche phenomenon to really be utilized. To put it bluntly, if you have never taken a formal avalanche course or had an amazing mentor this app may be a bit too much. Seek qualified instruction! 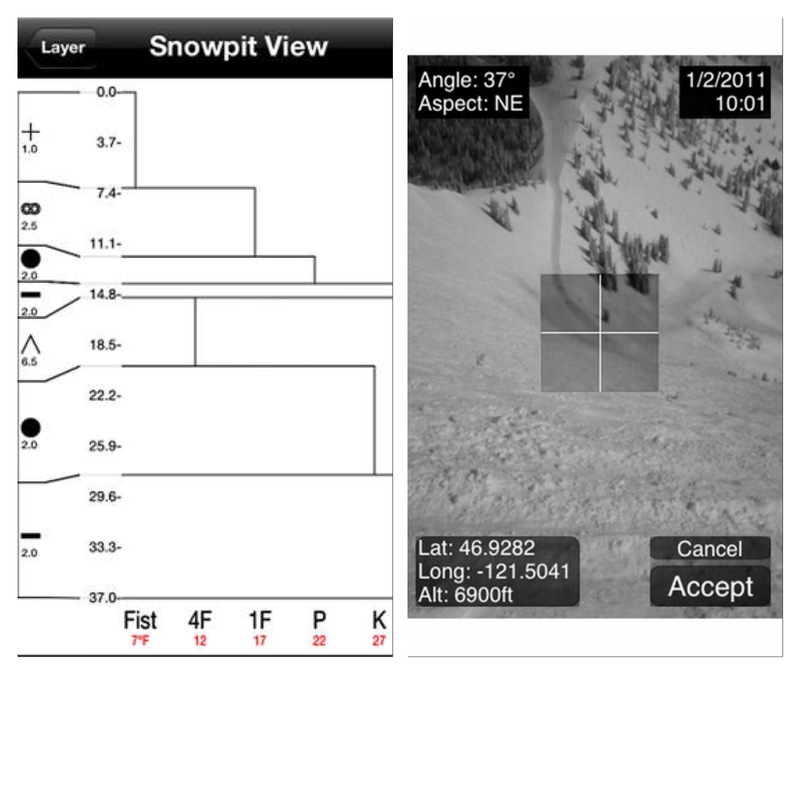 Automatic graphing of snow pack observations and instant aspect/angle/incline measurements using iPhone’s camera, GPS, and gyro-meter. So there are three apps to check out for this upcoming winter season. I’ve used them all on an iPhone 5s but will be switching soon to the iPhone 6s Plus, and I’d be lying if I’m not a bit giddy about all that screen space for navigation focused apps. I’ll also be testing a Thule phone case to protect that beauty from the type of abuse I expect it to take. Who knew Thule makes phone cases? I have some other snow focused apps I’ll mention in Part 3 of this series. In the meantime let me know what apps you rely on in the winter in the comments below! 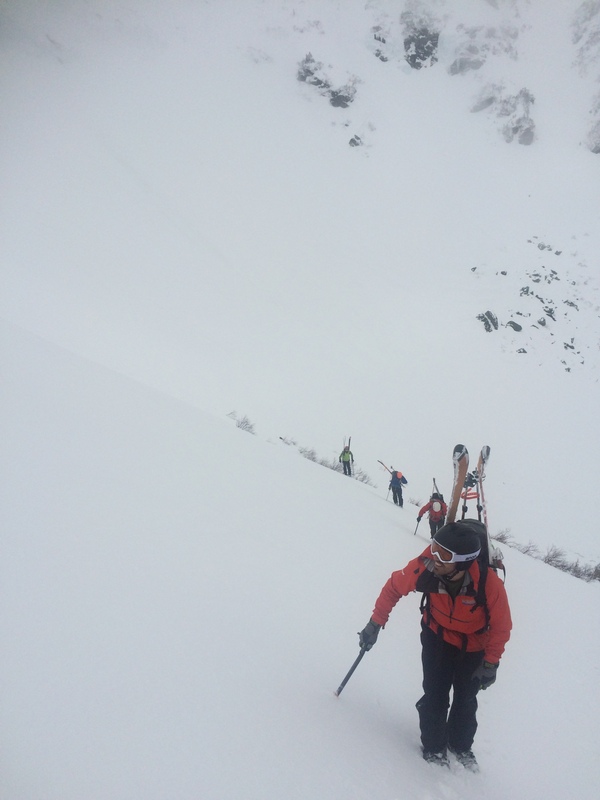 Yesterday wrapped up the 2nd AIARE 2 Avalanche Course of the season. Six Eastern Mountain Sports Climbing Guides, 3 from North Conway, 2 from The Gunks, and 1 from our Lake Placid location spent the last four days furthering their understanding of the avalanche phenomenon by improving their weather and snow-pack observation skills along with their rescue skills. After reviewing AIARE 1 information we spend the rest of our first day upgrading our rescue skills with focuses on deep burials, multiple burials, close proximity burials, and rescue leadership. The deep burial scenario required a full effort from everyone as our “debris” had set up like concrete and our target was a life size stuffed Gore-tex full suit! It took another 20 minutes of hard work to excavate the victim after reaching the “airway”. Searching in Parallel, Micro-strip Search, Pro’s and Con’s of Marking, and Triage were all topics of that afternoon. The next day was a heavy classroom day with lots of discussion on Mountain Weather, Online Resources, Metamorphism, and recording observations at the national standard in accordance with the “SWAG”. 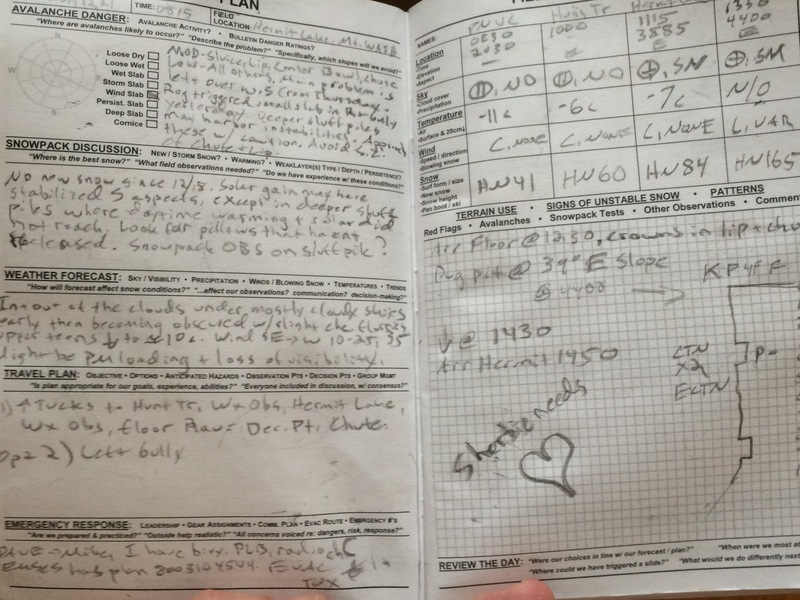 We spent the 3rd morning covering the “how’s and why’s” of doing a Full Profile. From there we went on a short tour up to just above tree-line via the Cog. 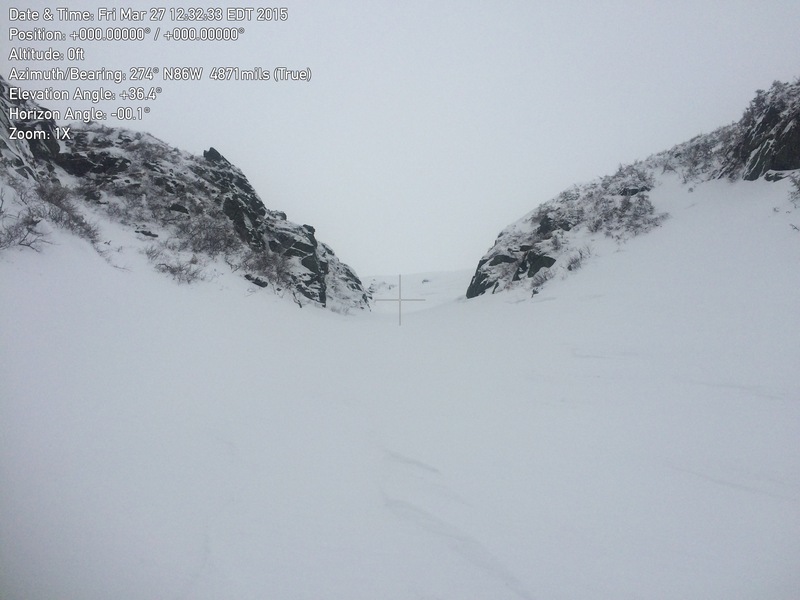 After some poking around in the snow and previewing terrain in the Ammonoosuc Ravine we descending the Cog in fairly good conditions. Right before the base the snow that had started falling around noon turned to rain and we wrapped up our day back at the Highland Center. For the last day of the course we met at Pinkham Notch and planned a tour into Tuckerman Ravine. We zipped up to Hermit lake in short order and had a quick birthday celebration for Ryan before updating our travel plans. Good skiing that requires very heads up attention! 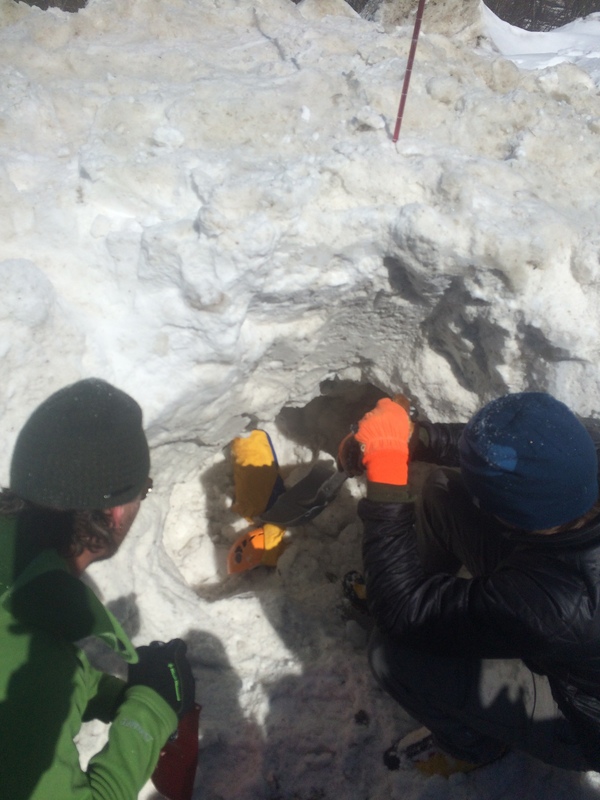 We skinned up a very stable Little Headwall and gathered at the floor of the ravine to make a plan. 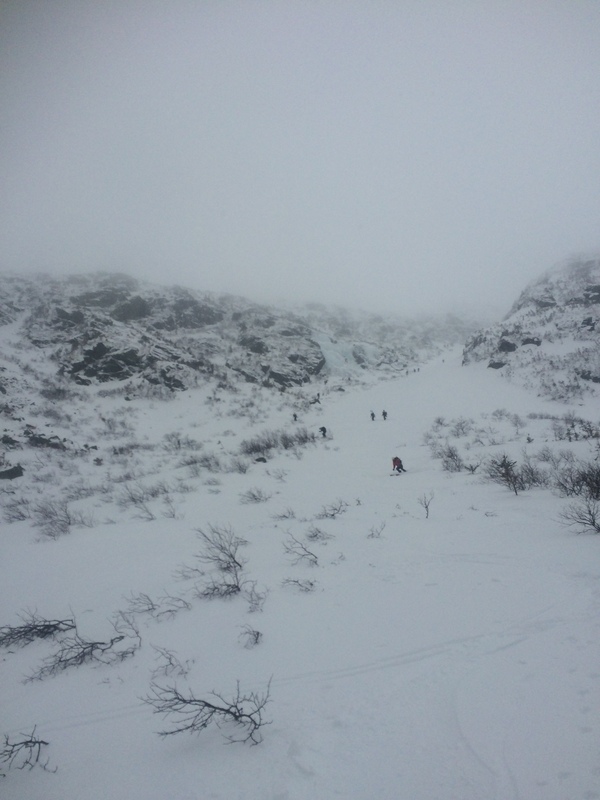 Our climbers headed up into Lobster Claw and our skiers moved across and up into Left Gully. Dustin and crew crossing the run out and starting the boot pack up climbers right side of Left Gully. With lots of probing and hand-shears we worked our way up below the ice fall to the left of Left Gully and after a brief group discussion decided we could push higher up to the “choke” of the gully. Just below the choke we get some fairly positive hand shear results but the slab that is failing is quite thin, only about 20-25 cms or so. Two of our group wish to push a bit higher, which seemed reasonable, so the rest of us de-skinned and spotted their last 100 foot climb to just above the choke. From here we all descended, one-at-a-time at first, then with good spacing down below. Turns were pretty soft in most spots with occasional sections of hard scoured surface. The flat light made it a bit tricky to really let it rip. Pretty decent turns and quite a few groups were appreciated the boot pack we had put in. It was a bit disconcerting to see so many without backpacks on… Where is your shovel & probe? It is still winter up there. 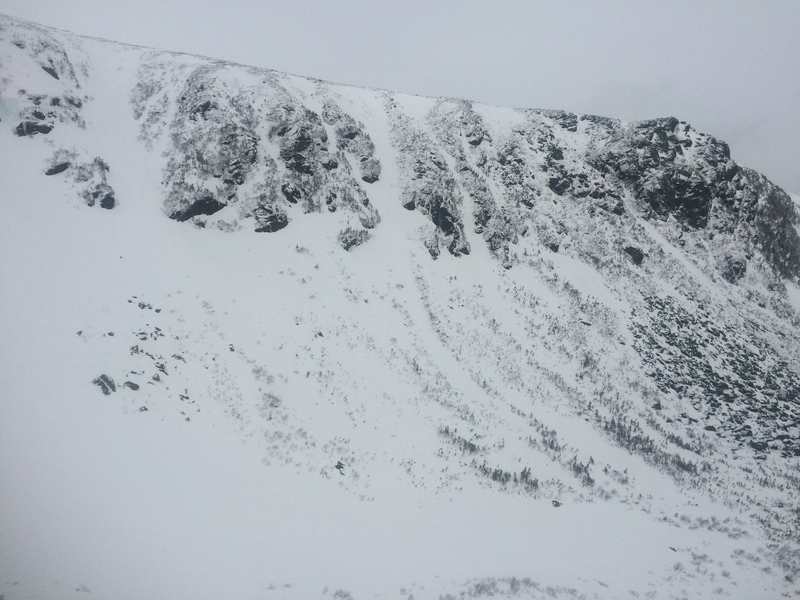 We gathered at the floor then descended Little Headwall to the Cutler River. The Upper Cutler was great. One of our group had skied the Lower Cutler (below the bridge) a week prior and the majority vote was to continue down it. It was the first I had skied below the bridge so with a smidgen of hesitation I followed the group down. 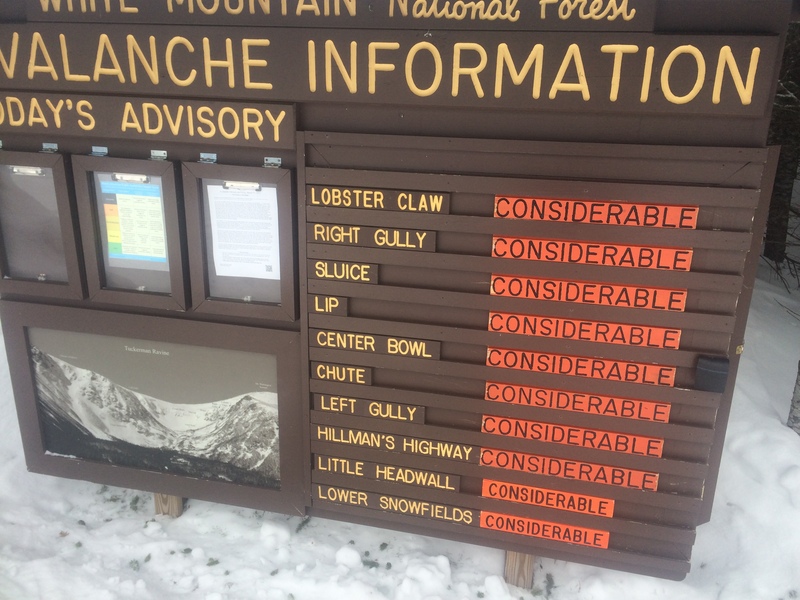 I can’t say it was great skiing, a bit to heavy mashed potatoes made for a few of those “must turn now” moments. One actively collapsing snow bridge with quite a bit of water right at the end made me glad to be exiting out along the Huntington Ravine trail to cut back over to the John Sherburne Ski Trail. I would suggest bailing at the bridge for the rest of the season… unless you are into that type of stuff! The rest of the Sherbi skied great though the warm snow was a bit slow as we got to the bottom. No complaints though, all it all a great run! Back at the parking lot we spent almost an hour and a half debriefing the day and the course in general. Feedback on the course was solicited and shared, and an honest look at what’s next was provided by recent AIARE 3 Graduate Keith Moon. Many of our guides are on tracks for AMGA certifications that will require an AIARE 3 Certificate, so links & suggestions for future learning were provided. This was a really fun course for me. Getting to work each day with many co-workers who I don’t often cross paths with was a great boon. I feel like I know each of them quite a bit better. 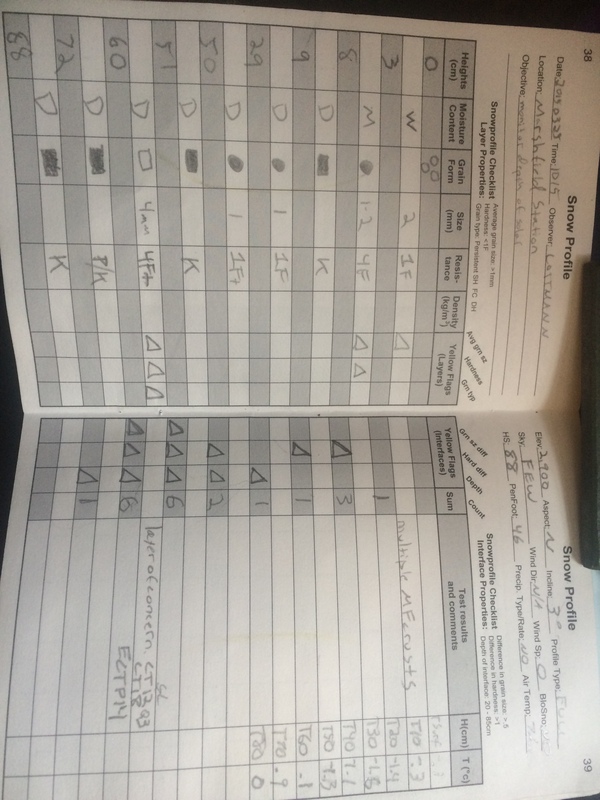 Their feedback will definitely help the AIARE 2 courses I lead next year improve. And despite a bit of rain the weather through out the course was fantastic. While I have the rest of the weekend off I’ll be heading back up the hill on Monday, and again on Friday. Then a short vacation before our first ever Mount Washington Observatory AIARE 1 Course! Then, and only then, will I let myself start focusing on the upcoming rock season. Winter ain’t over till it’s over! Yesterday concluded our first AIARE 1 Avalanche Course of the season and conditions were great for such an early season course! 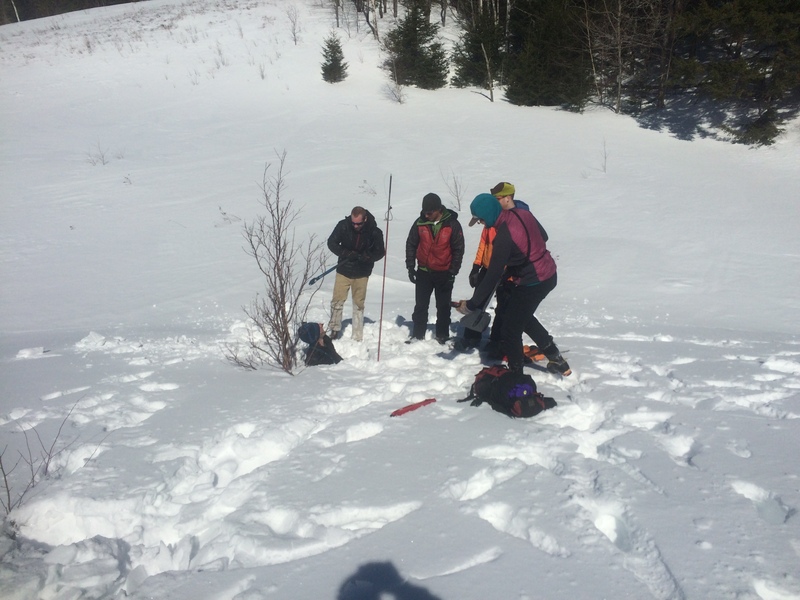 Two EMS Schools New Paltz, NY guides and one of our North Conway guides joined 8 other aspirant back-country travelers to learn about decision making and risk management in avalanche terrain. Do you know how this is formed and why it is important in relation to avalanche safety? What a treat it was to be able to skin all the way into the bowl so early in the season. The Sherbi was in pretty “fast” conditions and is definitely, as I noted in my book, in need of some love. Unfortunately Santa must have thought skiers where a pretty naughty bunch this year as he’s having his friend Mother Nature deliver us a hefty dose of our least favorite precipitation, rain. Personally I would prefer coal but what can you do. Let’s hope to bring in the New Year with some copious amounts of new snow! To the 11 engaged participants of this first avalanche course of the season, thank you for making this a fun and productive 3 days. See you in the mountains! UPDATE 12/10/14: Please see additional information from this incident with a first hand account of what happened here. Have you put fresh batteries in your beacon yet? Now is a great time to get outside with you partners and run through some rescue drills. Remember it’s the people you tour with that will give you the best chance of surviving a mistake! Also, if you have procrastinated signing up for an avalanche course you might want to do so today. Out of 7 scheduled courses we are already sold out of seats for 4. That leaves only 3 courses to chose from and it is not even Christmas yet! Go here to find out more and sign up!